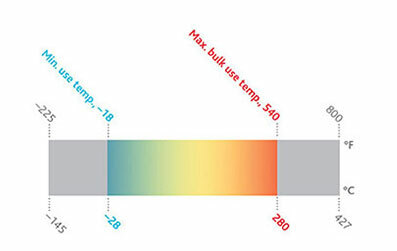 Therminol 54 is a synthetic fluid designed to provide reliable, consistent heat transfer performance over a long service life at maximum bulk temperatures. This fluid provides an excellent alternative to mid-temperature, mineral oil-based fluids by capturing the performance and nonfouling attributes highly desired of synthetic fluids. Product availability: Europe | Middle East | Africa. Contact your local sales representative for more information. Excellent pumpability—Therminol 54 supports operations with temperatures lower than possible with many other mineral oils. Non-sludge-producing chemistry—The use of Therminol 54 enables life-cycle operational cost efficiencies, including optimal pump seal life, fewer system cleanings between refills, and superior fluid life. Excellent resistance to fouling—Because Therminol 54 is a synthetic fluid, it resists the effects of oxidation 10 times better than mineral oils.